Harrison Ridge is a wooded, small community tucked into the West Cobb area of Kennesaw. 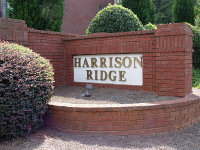 Harrison Ridge is around the corner from great shopping (Avenues West Cobb, grocery stores) services. All schools are close enough to ride a bike or walk. Harrison Ridge is a neighborhood of traditional homes priced between $260,000 and $389,000, with covenants to protect your property values. Most lots are wooded. Harrison Ridge is a cozy, wooded community! Harrison Ridge has very nice amenities from for your family including a swimming pool, streetlights and sidewalks. When you are in the home selection process, be sure choose a home and neighborhood to accommodate your tastes. The schools zoned for Harrison Ridge are Due West Elementary, Lost Mountain Middle and Harrison High School, a Cobb County school of excellence. Harrison Ridge has a Homeowners Association that oversees the neighborhood business. Covenants protect your privacy and property values, which helps to keep the neighborhood clean and retain your investment value. Harrison Ridge is located on Due West Rd in Kennesaw, directly across from Harrison High School.